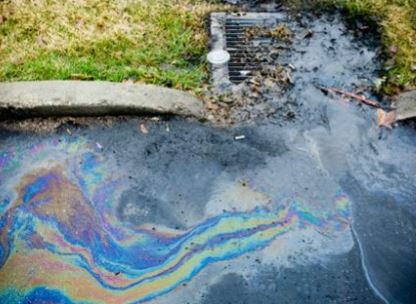 EPA photo of contaminated water flowing into a storm drain. As a former environmental engineer himself, Sununu told Pruitt he understands the importance of clean water, but insisted the new MS4 permit for municipal storm water discharge would be too expensive for the 44 municipalities required to comply. “I believe (it) will prove itself burdensome on many New Hampshire cities and communities,” Sununu wrote. Rochester alone could face spending $25 million in compliance costs, he said. Tom Irwin, vice president and director of Conservation Law Foundation New Hampshire, was concerned about the letter to Pruitt, which was emailed to reporters late Friday afternoon. Irwin said he hopes this isn’t the start of a trend in which governors seek Pruitt’s help watering down important regulations that protect the environment. “This letter is clearly the result of certain municipal officials reaching out to the governor,” Irwin said. Pruitt proved a controversial choice for President Trump because he doesn’t believe carbon dioxide is a major contributor to global warming and he has sued the EPA multiple times when he was Oklahoma’s attorney general. “We are very concerned having Scott Pruitt in this position at the EPA, someone who is now denying the significant role carbon dioxide and fossil fuel have played in accelerating climate change and for his repeatedly suing the EPA,” Irwin said. Sununu said in the letter that he enjoyed meeting Pruitt last week at the White House while he was attending the National Governors’ Association meeting. New Hampshire has a long history of managing its lakes rivers and bays, Sununu wrote. “Even if these federal mandates disappeared tomorrow, New Hampshire would not cease to keep our waters clean,” Sununu said. He went on to say that some regulations are reasonable. “We rarely trust in our government as much as when we turn on the water tap expecting clean water. “That being said additional mandates within the new MS4 will prove themselves overly burdensome and enormously expensive for many New Hampshire communities,” Sununu wrote. Sununu asked Pruitt to visit as soon as possible saying he wants to avoid costs to municipalities, businesses and property owners that could hold back the economy and delay progress. “I know that by listening to those on the front lines, we can illustrate our desire to balance sensible regulations with local freedoms and responsibilities,” Sununu said. was in decline for many years. “We are making good progress there modernizing the many sewage treatment plants,” Irwin said. The other major source of pollution is runoff from roads, parking lots, and rainwater runoff, he said. The runoff picks up pollutants, toxins, nutrients, bacteria, which ultimately end up in the waterways, Irwin said. “It’s the most significant threat to water quality now. It’s an issue we need to address if we going to be serious about cleaning up water,” Irwin said.